There are three main types of pricing. Cost Plus, Market Based and Value Based. They are all very related to each other and you should understand all three methods when choosing how to set a price for your product or service. You can also mix, match and combine all of the above in any different way you can imagine when it comes to understanding the customer perception and willingness to pay. In the end, the only price that matters is the one that the customer actually pays. These three methods are three different ways to try and understand what the customer may be willing to pay for your product. If you do all three of these you will be much further in understanding what price you should set for your product and why. Cost Plus Pricing adds up all of the costs associated with producing a salable product and adds a gross margin to those costs to set a price. The important part of this method is to appropriately understand your costs so that you account for them in your cost estimate. We’ll be amortizing development, capital and indirect sales expenses. We’ll also be looking into variable overhead expenses and allocation of fixed overhead. With appropriate cost estimates, it is possible to understand where your price should be to be profitable. Market Based Pricing is all about understanding what is the going rate for a similar service to your own. When you know what range of pricing your competition is using, you can choose where in that range you would like to target. This works the best in markets where there is a decent amount of competition and you are able to gather information on competitive pricing. For Market Based Pricing a pricing ladder is an excellent way to graphically display the competitive market pricing landscape. Value Based Pricing attempts to understand the value which your product creates for your customer in their environment and capitalize on some of that value by setting the price for the product or service relative to how it benefits the customer. Value based pricing starts with identifying the Next Best Alternative (NBA) which we’ll be comparing our product to. We’ll list unique product features and describe what value our product creates for the customer compared to the NBA. The art of science comes in when we calculate how much value each feature creates for the customer’s business. Then we estimate how much of that value we can capitalize in our pricing negotiations. Pricing Ladders visually stack price options relative to each other. 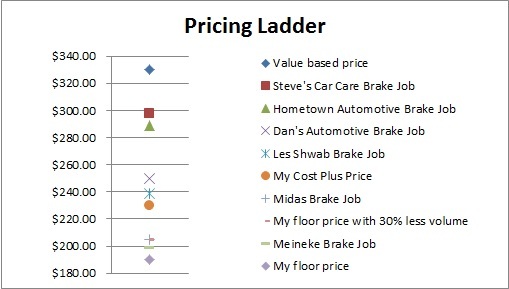 Most pricing ladders use only the vertical axis of a chart to display all of the options included. Pricing ladders should include prices from Cost Based, Market Based and Value Based pricing (if completed) and should also include what is called a “floor price” which is the lowest price your business is able or willing to sell the product at. With this basis we can include additional analysis points such as specific business scenarios or points of interest from a Sensitivity Analysis. Once the ladder is complete, it is easy to gain a feel for what pricing is realistic and if the business can be profitable and realistic for you to compete. In many cases it is beneficial to combine more than one method for different parts of your negotiated price. For example, if I have a base software product that I’d like to start selling but one customer would like to modify an aspect of the software that is specific to their needs and internal processes. If you are certain that you’ll never use that customization for anyone else, you can use a cost plus approach for the incremental work. Instead of saying “no”, you can say “That’s not really a standard feature, but we’d be happy to do some customization for you if you’ll help cover the cost of doing so. Here is our estimate of what it would take.” In this case, you would charge your normal service fee as one line item on the quote or invoice, but then you would charge labor associated with modification on a cost plus basis. That’s not the only way of doing this, but it does allow you to help cover the cost of customization and avoid saying “no”. A high priced “yes” is often times received better than a flat out “no”, especially if you explain why. I know of one very large company in which it is customary to ask for everything under the sun from suppliers. Some suppliers would give it all away when in reality, the customer knew there was incremental cost associated with the ask. This very smart customer company was either hoping for the feature to be free as it often was, or was hoping to get a bid in response in order to analyze if the incremental investment was worth the money. Money talks, if it’s not part of what you do figure out what price would make it worth your time to do the work. You could get business and you also would probably learn a lot more about nuances of your industry this way as well. It takes an average of 5 minutes to read a 1000 word blog. Give yourself time to learn new concepts and tools that will help you make better decisions by subscribing. We believe every small business owner should have access to clear, concise, and effective tools that will help them make better decisions. Consider us your “Functional Excellence” department for business decision-making processes and tools.